A century after the death of the American painter whose masterpieces helped to introduce the island to the world, the Bermuda Masterworks Foundation has honoured Winslow Homer by naming its newly opened museum cafe “Homer’s” after him. Masterworks — which has three of the artist’s Bermuda paintings in its core Bermudiana Collection — opened Homer’s this week at its Botanical Gardens gallery. 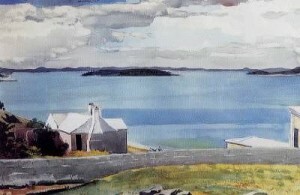 Described as ”the greatest pictorial poet of outdoor life in 19th century America”, the Bermuda works were among “the most amazing parts” of the Winslow Homer memorial show held at New York’s Metropolitan Musuem of Art shortly after the painter’s death at the age of 74 in September, 1910. Winslow Homer visited Bermuda regularly beginning in the 1880s and the quick, impressionistic watercolours he painted on the island celebrated its warm colours and brilliant light in a manner which has become iconic. “Thanks to this painter, generations of American visitors to Bermuda knew the island intimately before they ever set foot here,” said one historian of the island’s tourism industry. “They had grown up viewing Bermuda through Winslow Homer’s eyes. “His scenes of Bermuda were among the most commonly reproduced in 20th century America as prints and even in calendars and adorned the walls of tens of thousands of American homes. Before the advent of modern advertising techniques, it’s fair to say Homer’s timeless images of Bermuda helped to quietly sell the island as a beautiful, unhurried destination as effectively as anything the island did to promote itself. Opened in 2008, the Masterworks Museum of Bermuda Art boasts a collection of more than 1,200 pieces of locally inspired art including works by such greats as Homer, Henry Moore, Georgia O’Keefe. The gallery — along with Homer’s cafe — is open Monday through Saturday, 10 am-4 pm. What a wonderful interview Lise. I am so proud to tell everyone I know about our wonderful Masterworks Museum.